The Business practices of yesterday have become outdated and a new conscious way of doing business is here and it requires some heart and soul. Daniel Gutierrez will show us how industries are changing their ways and how you can too. 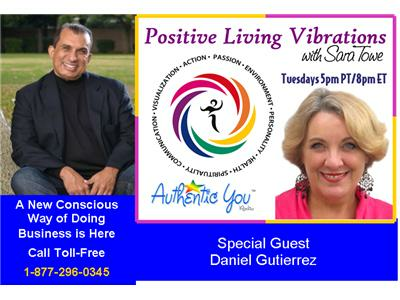 Daniel Gutierrez is an international business consultant, radio personality and renowned motivational speaker who has inspired people to make positive changes that lead to success. Leveraging his experience, his infectious humor, and his deep belief that there is greatness in each of us has helped transform individuals all over the world. When Daniel shares his real-life stories that come from the heart, his appeal breaks the boundaries of many professions, ages and cultures. People identify with the pitfalls and celebrations, the tragedies and the successes, the heartaches and the search for inner peace. Based in Los Angeles, Daniel has been the cover story in Latin Business Magazine and listed in its “Top 100 Hispanics” along with other extraordinary individuals such as actor Edward James Olmos, Los Angeles Mayor Antonio Villaraigosa, and CNN’s Soldedad O’Brien. Daniel was featured in the documentary film Luminous WorldViews as one of eighteen world renowned thought leaders in the area of transformation and leadership. Through this latest book, Daniel offers his own strategies for success and personal and professional transformation, and now invites you to step into your greatness.